At Ultra Bin Hire & Demolition, we can provide professional and comprehensive construction site cleanups in Melbourne. Our highly trained specialists can ensure that your work space is clear of building waste and construction debris so that you can get on with the job at hand. If your construction waste is getting out of hand and you need prompt assistance, we can provide an easy solution to your problem, helping to minimise dangerous risks and improve the safety of all workers on-site. At Ultra Bin Hire & Demolition, we boast an extensive portfolio of residential and commercial site cleanups in Melbourne. Our projects have ranged from smaller private structures such as backyard garages and domestic dwellings through to medium sized commercial buildings and large industrial sites. No matter what your requirements entail, there’s nothing we can’t help you with. At Ultra Bin Hire & Demolition, our site clean ups in Melbourne not only meet all industry guidelines and regulations but also place a very large emphasis on safety and environmental responsibility. We have access to the latest equipment and employ the most effective methods, allowing us to maintain the highest standards of workmanship. We also care about the environment and aim to ensure materials are disposed of safely and responsibly in an eco-friendly manner. Excavation – Our excavation services can help you prepare a site for construction. Whether you need to level a slope or dig a basement, our team has you covered. 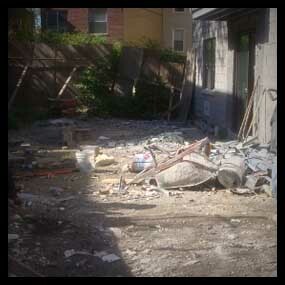 Demolition– We’re proud to offer residential and commercial demolition services across Melbourne. Our aim is to complete each and every job efficiently without compromising on quality. Rubbish Removal and Bin Hire – From hard rubbish services through to cheap skip hire in Melbourne, there’s nothing we can’t help you with when it comes to rubbish removal. Ultra Bin Hire & Demolition is the number one choice for professional site cleanups in Melbourne. Give us a call on, enquire online, or click on the quote button below for a free quote.